In this post I decided to do monthly challenges this year. This page is where I can keep track of my progress and add details for myself. You can also click “challenge” in our tag cloud in the right sidebar. This page will change throughout the year, whether I complete a goal or decide to do a different one instead. Jan.: Figure out list — complete! Outcome: This was a bit ambitious, especially considering the shortness of February. But, watch for the second and third book reviews coming up in early March! I did write 3 reviews and read at least 3 books. So, mostly success. I didn’t have a special blog-related writing goal this month, but I did have my normal all-the-time write for 30 minutes goal. 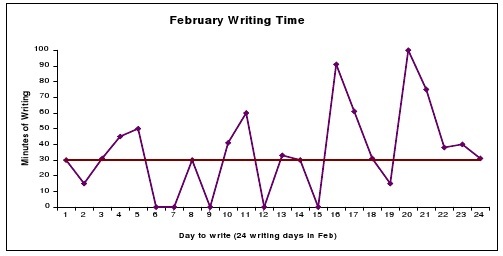 This month I wanted to see if I could write 30 minutes per day for 6 days a week. In February I was at or above my goal of 30 minutes on 70.83% of designated writing days. This is above where I was last year in February, which was more like 63%. As you can see, I had a little bit of binging in my February writing, but it’s not entirely my fault. Some of that mid- to late-month action was due to a grant that was largely under someone else’s control. I also had too many days of not writing at all; gotta fix that. I now have a good baseline to work from for my August writing goal. In this post we reflect on the end of February and the beginning of March. continue to keep the inbox empty each day, while progressively emptying the to do folder, with the goal of having it totally empty by the end of the month. I will therefore have gotten a lot of tasks done that come to me by email! Update, day 2: I may have to ditch this goal. It is so overwhelming. I’ll try to hang in there a bit longer. At least I have reduced my amount of pending email, which is progress. Update, day 8: Halp! Too much email! Update, day 16: Some progress, but also lots of new mail. Lots and lots. Like, I mean, a LOT. Update, day 28: Epic fail. In this post, I reflect on failure. (and possibly time-tracking) — I discovered this makes me resentful, and I am trying to have a successful month after a rough March. So we’ll stick with something that seems more immediately beneficial. Outcome: a decent, if uninspiring, showing. I still hate flossing, but I did it. Every-other-day schedule, mostly. Will May be more interesting? Stay tuned! I will cross off tasks as they are done… watch me go! Update after week 1: these aren’t finished but a lot of them are in progress! My house is a mess but it’s a mid-organization mess. Earlier I had to vacuum up some spiders WITH EXTREME PREJUDICE. How many spiders does one small place need? Also, I have invited some people over for Wednesday, which will force me to clean some. Update after week 2: inviting people over totally worked, yo. But there’s only so many times that can be done. I hope to continue progressing next week! I forgot I’m going out of town in week 4, so next week I really gotta kick it into gear. sign up for a community-supported agriculture (CSA) half-share before May 1— done! keep in a supply of pre-made, easy to eat protein, such as hard boiled eggs, diced cooked chicken, etc. Later, June 21: Last night, I made a pesto thing. It had: 2 kinds of basil, mint, some frozen peas that I thawed, salt and pepper, lemon juice, olive oil, almonds, walnuts, chives (including a flower), a garlic ramp, and regular garlic. I think that’s it, unless I forgot something. Later I stirred some grated parmesan and romano cheeses into it. It’s pretty good. I put some in the freezer and another big blob of it in the frig to go on pasta. I also got eggs to make a frittata or omelette thingy out of all the greens I’ve gotten from the CSA. And I’m firing up the mojito machine for the rest of the mint (note: not an actual machine). Turnips are over, scallions are in. Nom nom nom. Outcome: Success. It went well and I am continuing with this throughout the whole rest of the summer. Veggies veggies and more veggies! They are getting delicious now that the greens are over. This is going well! I continue to make & freeze food for later, including pesto-thingies, smoothie-thingies, lunches. Lotsa garbanzos on the protein front. Also, frozen, easy-to-make fake meat. Ham for sandwiches. They’re giving me lots of allium things, too. Nom nom. Eggplant! Cucumbers! Carrots! Cabbage and beans and basil oh my. also see about wills, power of attorney, and all that noise. Make a folder for use in case of my death or incapacity. Outcome: Utter fail. I was so exhausted from moving that I would collapse in a chair, unable to form complete sentences, falling asleep sitting up, hours before my usual bedtime. oops. However! I still need to see about the legal stuff now that my partner has joined me here (YAY!). So perhaps I will do that stuff soon and cross it off later. track my spending all month, as suggested by Your Money or Your Life — DONE! consider how much of my emergency fund I need to have liquid, and possibly invest some. (Treasury bonds?) — I opened a Roth IRA and maxed it out for 2011. That’s all the thinking I can do right now. Outcome: Mostly a success! I did a lot of work here and we’re continuing the budget spreadsheet. Sell all individual stocks and sucky mutual funds (except the one). Reinvest. Chase IRA moved to Vanguard, reinvested in Target date 2050 fund. Requested full control of American Century. Outcome: I had big success! Check me out and congratulate me. Outcome: In this post and the comments I bewail my fate, which has to do with November as well. In this post and the comments I bewail my fate, in the beginning of November. I am trying some things but it is very time- and energy-consuming. Argh! 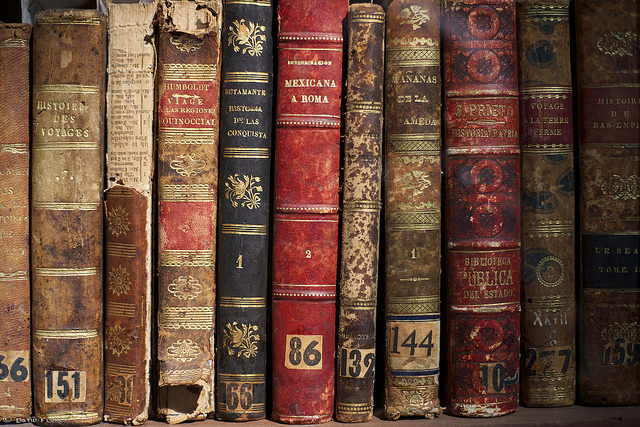 Dec.: catch up on academic reading — all piles, books, etc. Rock on! This list is AWESOME. Are you going to do this again in 2012? I dig it.